Plano West’s Shelby Spencer, left, and Catie Kim celebrate Friday’s 13-6 win over Prosper. The Plano West softball team captured the District 9-6A championship on Friday following a 13-6 victory over Prosper. Plano West senior Elisa Rosado totaled four hits in Friday's win. A three-run homer by freshman Gabby Coffey put Prosper in control early on Friday. 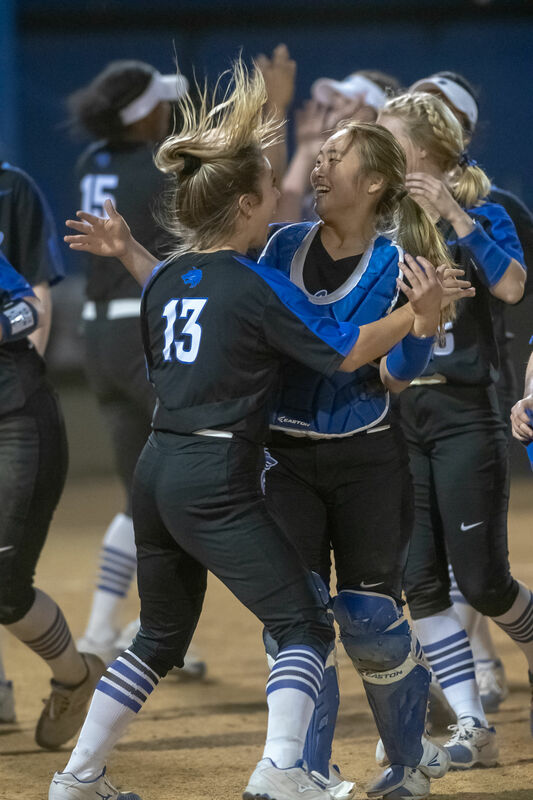 One year removed from a season mired in injuries, growing pains and a rare missed playoff appearance, the Plano West softball team was all smiles Friday night. From postgame hugs to joyous jumping up and down, and even an attempted water cooler bath for head coach Mike Ledsome, the Lady Wolves’ (10-0 in district) bounce-back campaign now includes a District 9-6A championship after erupting for a district-high in runs scored in a 13-6 victory over visiting Prosper (7-3). Doing so on Friday required overcoming an adversity like no other on the Lady Wolves’ unblemished 9-6A résumé – blindsided by a hot-swinging Prosper offense for a 6-0 deficit through one-and-a-half innings. Having not allowed more than three runs in any of their prior nine district outings, the Lady Wolves were at the mercy of the Prosper bats, helmed by a three-run homer from freshman Gabby Coffey in the first inning. Fellow freshman Ayden Allen plated two more runs on an single to right field in the second stanza and later beat out a throw home on a short grounder up the middle to put Prosper in control, 6-0, before star senior pitcher Tatum Boyd could so much as record her first strikeout of the contest. Despite the Lady Eagles’ promising start, the Lady Wolves returned fire in the form of 13 unanswered runs – 10 split between the second and third innings. West batted around the order in both innings, totaling 10 hits and getting all nine batters on base at least once. Jamie Cendana tied the contest up at 6-6 in the third with a two-out triple before an Elisa Rosado grounder resulted in a Prosper error that scored Cendana for the Lady Wolves’ first lead of the contest. Three batters later, Morgan Luster blew the game open for the soon-to-be district champs, ripping a sharp grounder down the third-base line to clear loaded bases and grant West a 10-6 advantage. The Lady Wolves didn’t relent, swelling their lead with three more runs in the fifth inning, including one manufactured off an intentional walk of Boyd that resulted in the star pitcher immediately stealing second base while Rosado scampered home. Prosper opted to intentionally walk Boyd three times on Friday – a tactic clean-up hitter Luster benefitted from to the tune of four RBIs on 2-of-4 hitting. She was one of six Lady Wolves to log at least two hits on Friday, led by a scorching 4-of-5 effort from Rosado, who fell a home run shy of the cycle. Catie Kim, Chandler Gurney, Faith Counter and Cendana all added two-hit performances as well, pacing the Lady Wolves to a 17-hit night against the Lady Eagles. Prosper, meanwhile, was fueled by three-hit outings for Coffey and freshman Syndey Lewis, the latter doubling twice in the loss – a setback that kept the Lady Eagles alone in second place in 9-6A entering the final week of district play. The Lady Eagles look to bounce back at 7 p.m. Tuesday at Allen, while the Lady Wolves – now two wins away from a perfect district record – visit Plano East at the same time. “It really shows how much everyone on the team worked over the summer and how much everyone is dedicated to pulling this out for each other,” Rosado said of the district championship. “Everyone is really selfless and working for the team." WP – Tatum Boyd. LP – Elissa Griffin. 2B – PW: Morgen Luster 2, Elisa Rosado 2, Jamie Cendana, Chandler Gurney, Ariel Schachter. PR: Sydney Lewis 2. 3B – PW: Elisa Rosado, Jamie Cendana. HR – PR: Gabby Coffey.